The MoreAudio Nox is a Lightning dock with an FM radio and Bluetooth. It can also be used as an alarm clock with the option to set two different alarms. Let’s look at this Lightning dock radio in more detail. This Lightning dock looks very stylish. It’s available in two designs, one with a silver top and one with a black top. It has a stand for positioning your phone on top so you can look at it easily. The MoreAudio Nox automatically sets the correct time via your Apple device, so it’s an accurate alarm clock that will change for daylight saving times. The speaker has an air chamber and bass port to provide a good level of bass. The FM radio is decent, but the real benefit of this device is being able to stream music from your phone via Bluetooth or from an MP3 player using the aux-in cable. The Nox works well as an alarm clock with the option of setting two different alarms, so you could use on for weekdays and a later one for weekends so you can have a lie-in. The LED display can be dimmed and completely turned off at night so it won’t disturb you. This product is backed by an 18-month warranty, and MoreAudio also have a customer helpline in the UK if anything doesn’t work the way it’s supposed to. 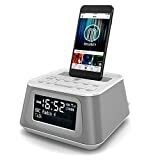 As long as you’re happy with just having FM radio and not DAB, there isn’t much to complain about with this Lightning dock radio. It looks great, has impressive sound quality and fulfils the expected functions of a Lightning dock and Bluetooth speaker very well. See it on Amazon here . 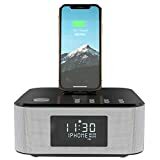 Another popular Lightning dock radio is the AZATOM Home Hub. Like the Nox, it has FM radio and Bluetooth and doesn’t have DAB radio. You can also check out this review of the best iPhone docking stations for less than £50. 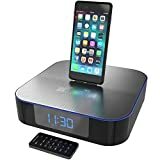 If you’re looking for a Lightning dock with DAB radio you have several options. If you’re looking for something cheap, consider the Madingley Rise Bedside Docking Station . It’s a small and cheap FM/DAB radio with a docking station. A more high-end option is the Roberts DreamDock2 , which has similar features but with a higher quality speaker.